Garlic scapes are a rare delicacy. 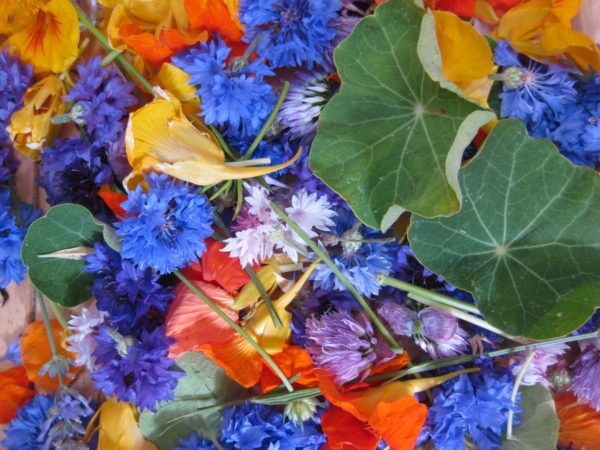 In spring they briefly appear at farmer’s markets then disappear. You may have come across them at the farmer’s market, wondered what they were, and moved on. 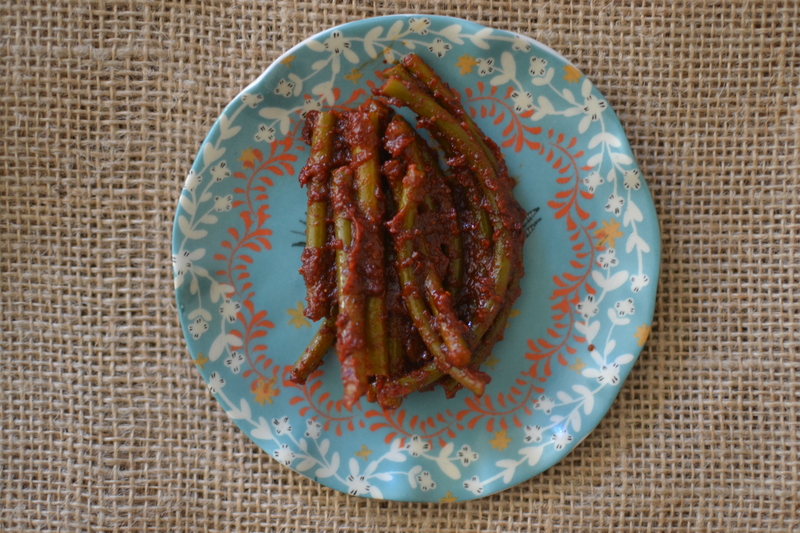 Garlic scapes have the crisp crunchiness of green beans with a mild garlic flavor. 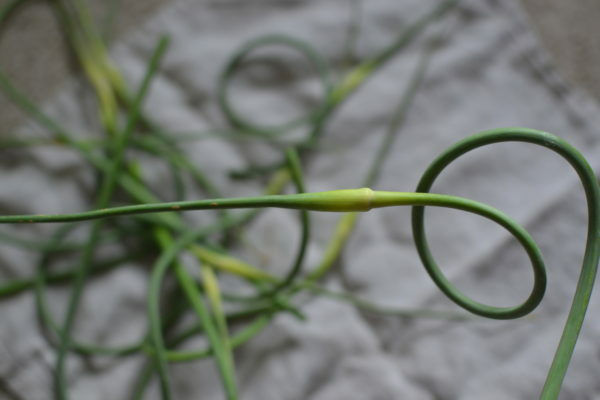 The best way to acquire garlic scapes is to grow them yourselves. 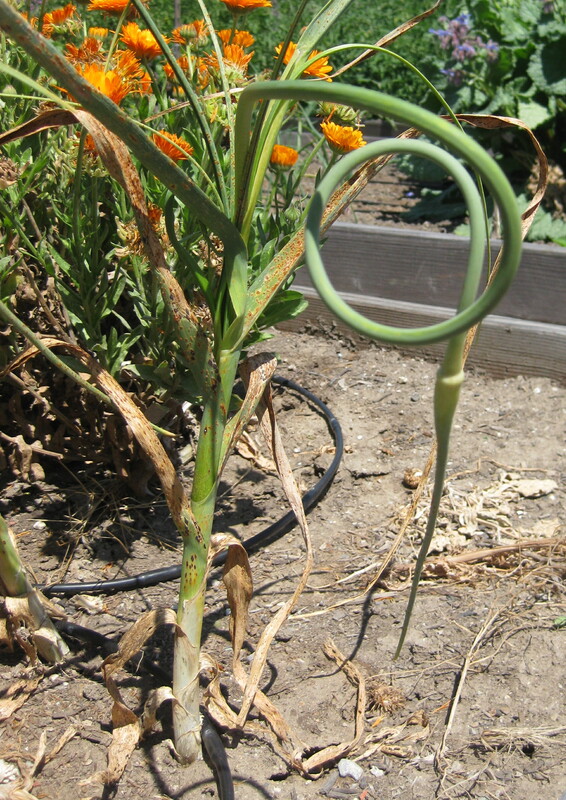 A garlic scape is the green curly stalk that appears from the center of garlic leaves in spring. This stalk, if not harvested, will produce dozens of bulbets that can be planted to grow more garlic. 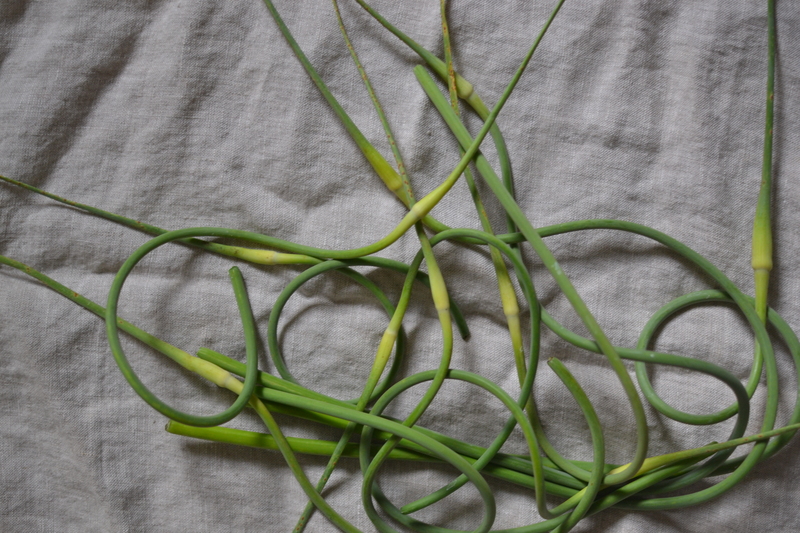 Not all garlic produce scapes. 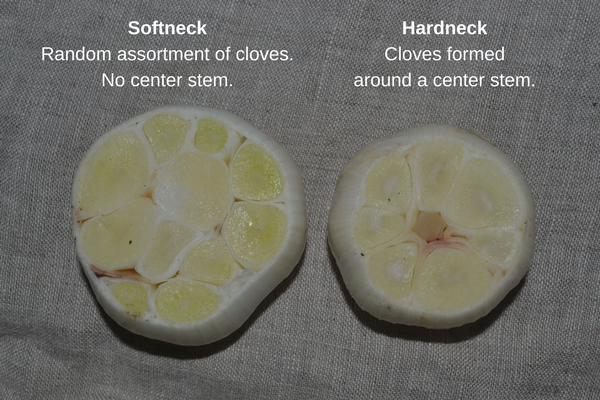 Before growing garlic scapes we must look at the two major categories of garlic, hardneck and softneck. Hardneck garlic (Allium sativum ssp. ophioscorodon) produces a flower stem that grows through the middle of the bulb. 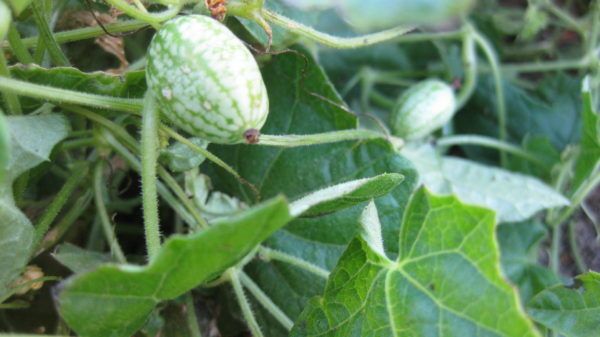 This stem appears through the leaves and is called the scape. Hardneck garlic heads tend to be smaller than softneck heads and do not store as long (3-10 months). They grow best in cooler climates. Fresh hardneck garlic in a market. Softneck garlic (Allium sativum ssp. sativum) varieties are the ones commonly sold in stores. They do not produce a scape. These varieties tend to be less flavorful than hardneck varieties but grow larger and store longer. They grow better in climates with hot summers and mild winters. Start with a hardneck variety. 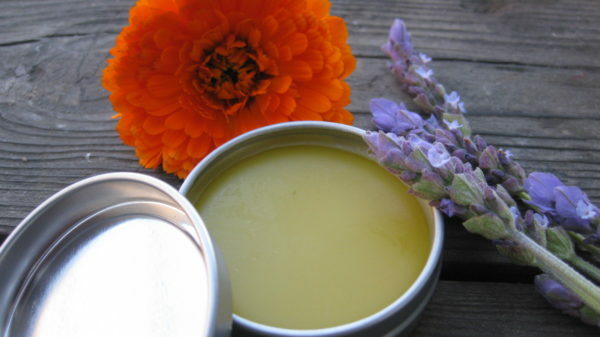 If you can find an organic bulb at the farmer’s market you can use that. Remove the largest individual cloves (do not plant the small ones as they will not make large bulbs) and plant them 2 to 3 inches deep leaving the papery skin on. Make sure to plant them root side down and pointy side up. In the fall, before the first frost, plant the cloves 3 inches apart (or tuck them all over your garden into empty spaces). In Southern California, I plant them around Halloween. During the growing season keep the garlic moist but not soggy. A layer of mulch will help maintain soil moisture and temperature. 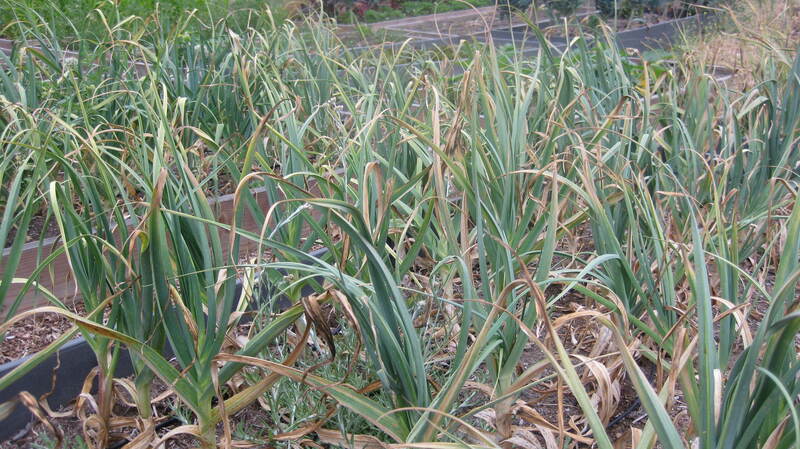 In mid-spring, the scapes will emerge from the center of the garlic leaves. Cut them off at their base when they are 4 to 8 inches long. Use the shorter more tender scapes fresh in pesto or salads. Cook the longer scapes into pasta or other dishes. Garlic scapes appear in spring. Cutting the scapes forces the garlic to put more energy into bulb production and results in larger bulbs. You will harvest the bulbs 1 to 2 months after you cut the scapes. 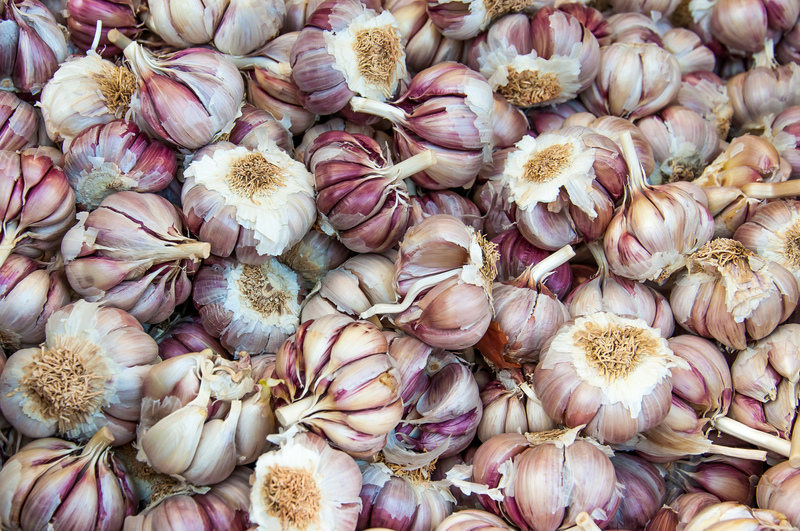 If you want to become a garlic expert the best resource to get you started is Ted Jordan Meredith’s, The Complete Book of Garlic: A Guide for Gardeners, Growers, and Serious Cooks. 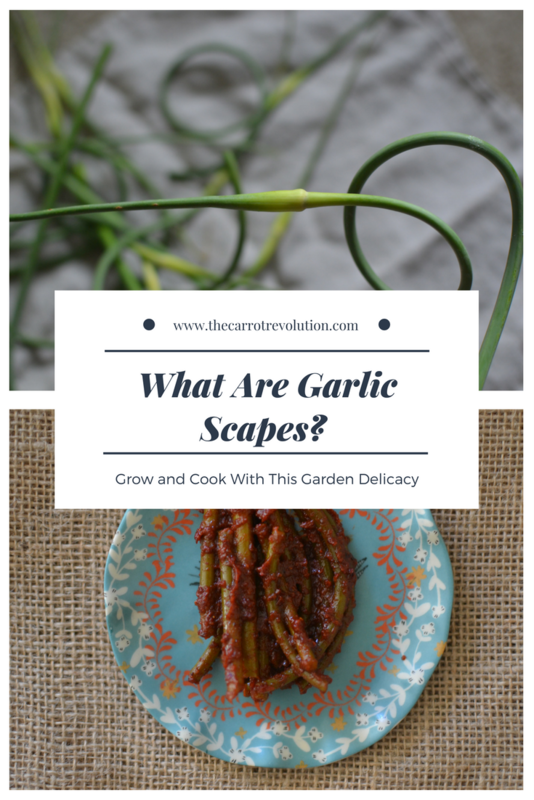 One of my favorite ways to use scapes if to make Korean style spicy garlic scapes. Boil the water and salt. Cut the scapes into 2-inch sections and place in a large heat-proof bowl. Once the water has boiled and the salt dissolved pour into bowl with scapes. Cover the scapes with a plate and set in a cool dark place for 3-4 days to ferment and soften. Drain the scapes. Taste one, if it is too salty give them a quick rinse. Mix the remaining ingredients in a bowl until thoroughly combined. Add the scapes and mix into the sauce until coated. I prefer to do this by hand, you may want to wear food-safe gloves if mixing by hand. Pack the scapes into a large jar. You can eat them right away or store them in the fridge.